Why pack light when you can fill 70-80% of the boot plus the back seat? We would never get our stuff just on the back seat for a weekend away. 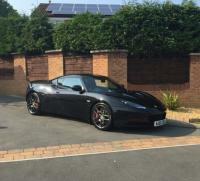 My MY11 Evora S; the next chapter(s). I'd be more interested to hear the car being driven away under load, I have tried to find some good exhaust videos but you tube is full of pointless revving the nuts off it videos. Cars always sound far better under load yet very few people actually seem to video it for some reason. I put the car in for an MOT today locally as I have not had time to get it done and would of liked it sorting for weekend. It failed as unknown to me the offside repeater had stopped working...Anyhow as it had been noted previously that my drop links were getting worn I asked them to look at it while it was in there and if they could get hold of some to sort it there and then. They could not get any locally so they checked them and advised they were worn but they have not been replaced.I have only just got home and the car was dropped off earlier so I went to put it in the garage and when its on anywhere near full lock the front end is slipping or jumping... I had noticed it mildly do this previously when pulling out of our street but never like this. It is quite alarming.It did not do it last week when I pulled it out of the garage so something is different now. I am going to phone first thing and see if they had removed the drop links to check them.Does this sound like something an incorrectly fitted drop link would cause? The garage has a pretty good rep locally but obviously no Lotus experience.I cannot see what they could of done on the MOT to cause it I have drop links on order but I think I will get PMS to fit them now... I figured it would not be a difficult job will it be safe enough to drive? It seems ok at normal speed as I gave it a quick blast up the street. Hmmm, I am not sure I get that, what if you do not have a sports racer, seems like a funny idea. To my eye they should flare to the edge of the rear arch, why have them parallel on a car that does not have a straight edge on it. If you look at the GTE they go to the edge of the arch, that's how I would have mine... In carbon... Yummy. The only thing I have noticed with the alloy Seloc ones is that they do not appear to come to the edge of the rear wheel arch, unless its a photo graphic illusion? IPS software upgrade to 400 spec ?